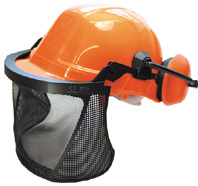 This protective helmet, complete with ear defenders and super fine mesh visor meets with British standards. Suitible for both professional and domestic use. Colour supplied may vary. Delivery of this item is FREE to mainland UK destination (Highlands and Islands extra). Delivery normally next day if order processed before 12.00 noon, but please allow three working days.